In parts 1 and 2 of this makeover I shared how I got to this point. This is the part where I become really excited because I can finally start to make dream come to life! The first portion of building is boring and is spent is prepping the space to build. Doing things like removing items from the space, prepping the surface I’m going to be building on, removing baseboards, etc. Now it’s time to get to the fun stuff to make this dreamy closet makeover happen! I decided to build this closet out of real wood. I don’t like particle board because it sags over time and MDF is so heavy and has chemicals in it so I chose to use birch plywood 4′ x 8′ sheets. This was truly going to be a real, big girl dream closet! The last time I did a project of this size it was summertime so I could have the garage as a “shop”. This time I started the project in late Fall so the weather would be changing quickly and I knew I couldn’t set up shop in the garage for too long before it got cold. I also didn’t have daily access to a truck to haul the big, heavy sheets around. So this time I decided to try something a little different. I called in the help of the guys over at Home Depot to cut the wood down for me so I could fit it into a rented truck and get it unloaded into my garage quickly in an afternoon. I sketched my plan out and drew all of my measurements on paper and how I wanted each sheet to be cut so I could minimize waste. I then went to Home Depot and gave the crew my “cut list” and showed them the wood I wanted cut. I went home and did some other things and they called me when it was ready. The guys at HD and I are all on a first name basis now and that’s kind of fun! They probably think I’m nuts, but I don’t care. They’re nice to me and don’t treat me like I’m a ridiculous blonde so, for that, I am thankful. You can see what I meant in Part 2 about creating a good foundation to build the bases on. I didn’t even bother to patch up the holes that the collapsed wire shelving created and I’m not even sorry about it. They would be covered up by the new cabinets so I didn’t care to waste my time. I decided that the back of the closet would house most of my husband’s clothes. I wanted to give him a large armoire feel to his storage. So, I started with the idea of a large cabinet in the center for shirts, etc and long hanging storage on either side. 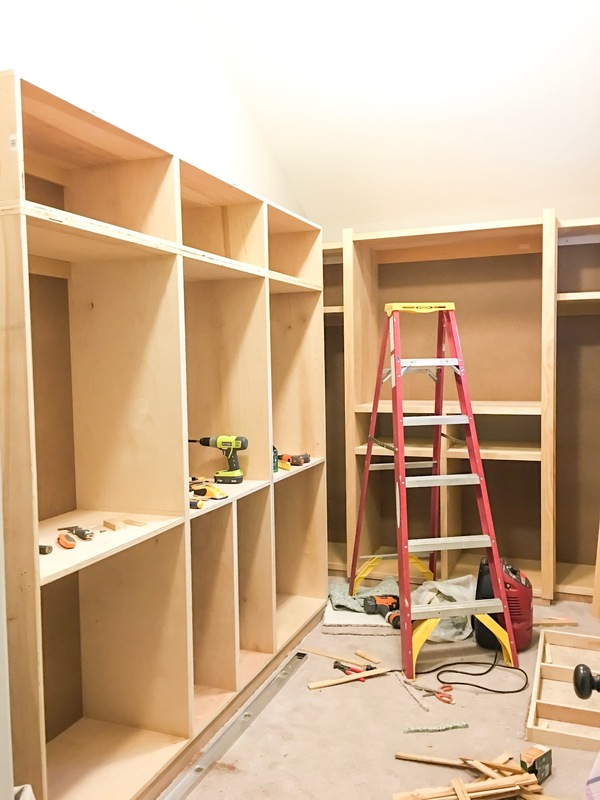 He is 6’3″ and has lots of BIG clothes so I have to make his cabinet the largest! Since his cabinet is the largest in the room I opted to place it on the tallest wall. Our ceiling is vaulted in the closet so that wall is really tall and could handle the mass of the armoire. Now, it’s ironic, isn’t it? That he is so big and manly and I am 5’2″ and not manly whatsoever and I am the one building this closet? If you have been following along through my projects, you know how I learned to build cabinets and do everything else I didn’t know how to do before we moved into this house. If not, well you can find out how I learned here. Sometimes what you put on paper doesn’t really pan out in real life. I didn’t like the way that the bottom portion was turning out. I spent time cutting and measuring and leveling and, and, and. Then I decided I only wanted two bigger cabinets in the bottom section of the “armoire” instead of three smaller ones so I took a break. I stared at the space and tried again, happy with the result of the cabinet this time. You will see that I was limited somewhat with the build because of that window. I chose to put it in there when we built and now I wished it wasn’t there. I like the light, but dislike the placement. But, there is nothing I can do about it so I had to figure out how to make the space work with the window. The next section to build was my side. I wanted a boutique feel for my clothes and I didn’t want to have to get a ladder out to reach them. So I built it at just the right height for me at MY comfort level! That is the beauty of building a custom cabinet. See the difference where his clothes will hang vs. mine? That was totally intentional! Yes…I had to see what the baskets would look like in the space and how high they would be! Would you do that? Start to bring in items that will go in the space just to see what it will look like? I am a little bit of a dreamer. I am also a doer, but I am a big dreamer. A tenacious, big dreamer! I got the cabinets built and screwed in place to the studs so they will be sturdy. Then I started to install the face-frames. A face-frame basically pulls it all together to give it a finished look and is made out of 1″ x 2″ (or whatever size you like) and covers all of the raw and unfinished edges of the plywood on the front of your cabinets. I like to install them one board at a time and fill in the gaps later with putty and then sand them down (vs. build one frame with pocket screws and attach it) no matter the cabinet size. Just personal preference. It is easier that way for me so that is the way I do it. I love putting on the face-frame! It gives me all the feels! It gives me a glimpse into what it will become once it is painted or stained. You can see the difference between his side with the frame and mine without. Now the kicker was this angled wall. It was a really awkward space. I had no idea what I wanted to do with it in the beginning. I decided to build a shoe tower there. That way you didn’t really see them when you first walked into the closet and the shelves didn’t need to be that deep. Perfect! Just this part of the closet took me a while to build because, well, it just did. My husband just dealt with it like a champ! Remember, we had all of the stuff from our closet all over our bedroom and he had to access all of his work clothes in another room. That is the hard stuff about living in a space where you are doing projects. I had 3 projects going at once. I was finishing the basement, putting in a bench seat and bookcases in my daughter’s room and building this closet. Bless my family. A lot of lessons were learned in this season! Next up? Part 4 where I share the rest of the build and making it beautiful along with some helpful tips for you! I look back now at these pictures and think “how did I manage to do all of this work?”. Where there is a will, there is a way! I would love to hear what you were surprised you could handle! Tell us all below! And don’t forget to sign up over on the left to receive my posts via email so you don’t miss a thing!